Sri Lanka’s disputed Prime Minister Mahinda Rajapaksa has stepped down from his post, signalling an end to a weeks-long political crisis that has kept the Indian Ocean nation without a functional government. 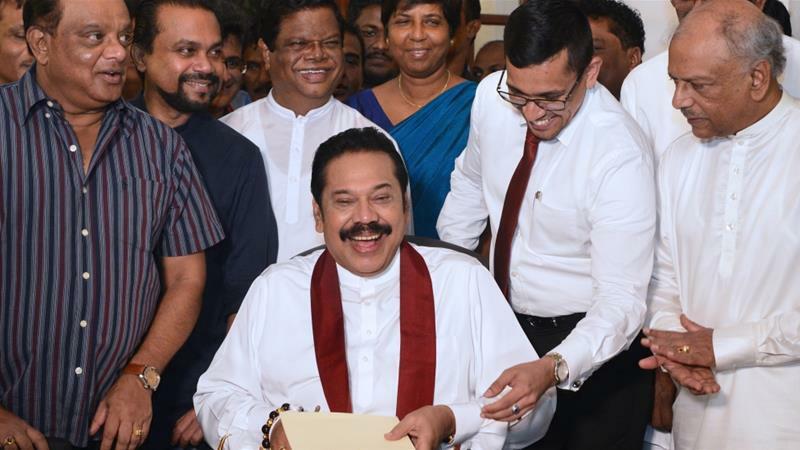 Rajapaksa signed a letter of resignation in front of supporters and journalists at his private residence in the country’s capital, Colombo, on Saturday. The 73-year-old former president made no immediate statement to reporters. Sri Lanka has been in crisis since October when President Maithripala Sirisena fired Prime Minister Ranil Wickremesinghe amid a bitter power struggle and replaced him with Rajapaksa, a popular leader who is accused of corruption and grave human rights abuses. The feud put the country on the path towards a government shutdown with politicians at loggerheads over who should remain Sri Lanka’s prime minister. Wickremesinghe refused to step down claiming his sacking was illegal, and his party, which has a majority in parliament, passed two no-confidence motions against Rajapaksa. But Sirisena ruled out reappointing Wickremesinghe and tried to dissolve parliament in a bid to hold new elections. That attempt was thwarted by the Supreme Court, which on Thursday said the president’s moves to sack the 225-member House was unconstitutional.